When ATOMOS released the Ninja 2, it was a godsend to those shooting with DSLRs. 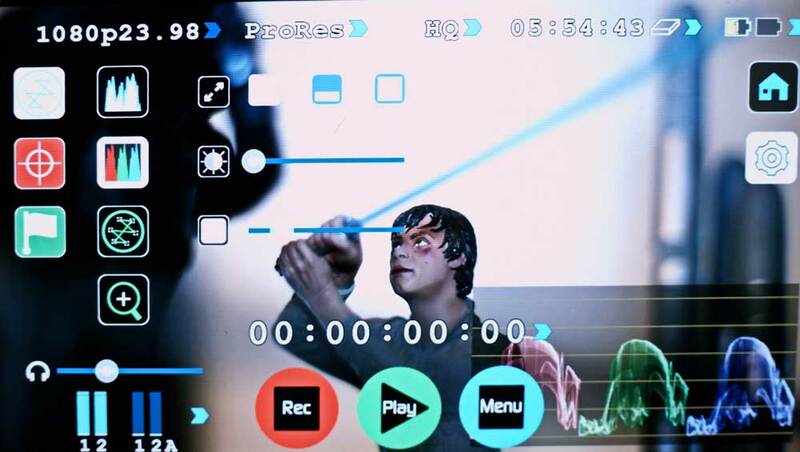 It allowed you to capture video, straight from the sensor via HDMI to ProRes HQ. This eliminated the need for any transcoding. This is necessary if you have any intention of doing any color grading as footage recorded with the .H264 codec just falls apart in post. However, last year when ATOMOS released the Samurai Blade, we saw an exquisite monitor via the new model. The trouble was, if you were an HDSLR shooter, it only had HD-SDI inputs which meant you needed a convertor to go from HDMI to SDI. However, all of that is now a thing of the past. ATOMOS has definitely come correct and made a massive effort in the release of the new Ninja Blade. The Ninja Blade offers the very best monitoring solution with an outstanding recording solution all in one amazing package. First, let’s address the monitor. It’s incredibly bright clear and simply gorgeous. The new Ninja Blade features 1280 x 720 SuperAtom IPS touchscreen, 325ppi 179-degree viewing 400nit brightness and multi-frequency (48/50/60Hz) operation depending on video input, giving super-smooth monitoring and playback. The Ninja Blade’s user interface is all touch screen. The controls are sensitive and accurate. It includes all of the great features which we will be covering in a video this week, but you can expect peaking, zebra, false color, plus all of the scopes you’d expect to find with the Atomos Samurai Blade, and they are all totally customizable. You can also see the Ninja Blade and the full range of Atomos products at BVE Expo www.bvexpo.com on the Atomos stand (G32) together with UK distribution partner Global Distribution. Melbourne, Australia – February 25th, 2014: Atomos, the creator of the award-winning Ninja and Samurai camera-mounted recorders, and the pocket-sized Connect converters, will launch the new HDMI Ninja Blade at BVE Expo, 25-27th February 2014 at the Excel Exhibition Centre, London. The Ninja Blade brings new levels of professional monitoring to camera mounted recorders for DSLR’s and any HDMI capable device. Atomos recorders have broken new ground in production by combining recording, monitoring and playback all in one easy to operate, portable device. Like the Samurai Blade, Ninja Blade allows the recording of pristine, 10-bit images straight from the camera sensor directly to inexpensive HDD or SSD drives, captured using Apple ProRes or Avid DNxHD codecs. Waveform, vectorscope and monitor assist tools such as tri-level focus peaking, zebra, false colour and blue-only offer a very comprehensive test and shot setup tool kit. The Ninja Blade takes advantage of low-cost, modern technology by utilizing HDMI-capable pro-video and consumer camcorders, as well as DSLRs. Many features from Atomos are designed with real productions and real situations in mind, to create smarter workflows, keeping the highest quality but also keeping running costs low. The Ninja Blade was designed with a long battery life. Atomos’ unique Continuous Power technology (patent pending) means that you never have to interrupt recording to swap batteries. The new Ninja Blade features a stunning 1280 x 720 SuperAtom IPS touchscreen, at 325ppi 179-degree viewing, 400nit brightness and multi-frequency (48/50/60Hz) operation depending on video input, giving super-smooth monitoring and playback. Every screen is calibrated to SMPTE Rec 709 colour space and a D65 white point with 100% gamut from factory. On-the-fly screen calibration is built into every Ninja Blade, so you are always accurate in any shooting environment. You can see the Ninja Blade and the full range of Atomos products at BVE Expo www.bvexpo.com on the Atomos stand (G32) together with UK distribution partner Global Distribution. For more about Atomos see www.atomos.com and Global Distribution www.globaldistribution.com. The Atomos Ninja Blade is now shipping for 995 USD, 749 EUR and 595 GBP (excluding tax and delivery) and will be available through the Atomos Worldwide reseller network. See www.atomos.com for more details. Atomos designs and manufactures smart production tools: affordable, easy-to-use field recorders and converters that save video professionals time and money, without sacrificing quality.